For Phase 5 of Heavenali’s #Woolfalong, we are asked to read some of Virginia Woolf’s non-fiction – essays or diaries. As I hadn’t read any of her essays or diaries at all until now, the choice was easy for me: A Room of One’s Own, her 1929 classic and possibly the book for which she’s best known. I don’t read a lot of non-fiction books so I wondered what I would think of this one. Well, I thought it was fascinating! The edition I read had just over 100 pages but so much is packed into those pages that I feel quite overwhelmed trying to write about it all. 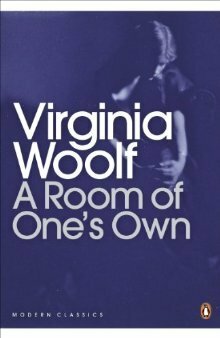 A Room of One’s Own is Woolf’s famous extended essay based on a series of lectures she gave at two women’s colleges at Cambridge University in October 1928. In the essay, Woolf uses a fictional narrator – whom she refers to at various points as Mary Beaton, Mary Seton or Mary Carmichael, names taken symbolically from a 16th century Scottish ballad – to explore the subject of women and fiction. As a starting point, she states that “a woman must have money and a room of her own if she is to write fiction” and then goes on to explain why she believes this statement to be true. For many women living in the modern day and experiencing a level of equality women in the past could only dream of, it may be hard to imagine a lack of money or a room of our own preventing us from writing if that is what we wish to do, but in Woolf’s day – and especially in the decades and centuries before that – these things could be very real obstacles. I’m not sure I completely agree that women must have a certain amount of money and their own room to be able to write, but Woolf’s arguments are very thought-provoking and make a lot of sense. Near the beginning of the book, we see the narrator attempting to enter a library and being turned away because it is for men only – ladies aren’t admitted unless they are accompanied by a man or have a letter of introduction. This is just one illustration of how women in the past were denied the same rights and freedoms which were available to men. Obviously this made it more difficult for them to bring the same depth of knowledge and experience to their writing that a man would have – and also much more difficult to become financially independent. Living in poverty, Woolf explains, meant that women were more likely to be deprived of a private space in which to sit and write and the spare time in which to do it. The narrator then goes on to imagine that Shakespeare had a sister, Judith, who was just as talented as her brother but had no opportunity to use her ability. She wasn’t sent to school, was given no encouragement to read and write, and ran away from home when her father tried to force her into an early marriage. Judith’s story is tragic, and Woolf uses it to show that talent alone isn’t enough; without equality and opportunity, it would have been impossible for Shakespeare’s sister to achieve Shakespeare’s success. She left her story, to which her entire devotion was due, to attend to some personal grievance. She remembered that she had been starved of her proper due of experience — she had been made to stagnate in a parsonage mending stockings when she wanted to wander free over the world. Her imagination swerved from indignation and we feel it swerve. As I’ve mentioned, this is a short book, but despite that I decided to read it slowly – the six chapters over six evenings – because I wanted to have time to think about what I’d read and to digest all the ideas and issues Woolf raises in each chapter. I would definitely recommend this approach to reading the book – and I would also recommend keeping a pen and paper beside you as you may find yourself desperate to make a note of your favourite passages as you read! So far this year I’ve read three books by Virginia Woolf; To the Lighthouse just wasn’t for me, but I loved this one and Flush. I haven’t decided yet whether I’ll be taking part in the final phase of the #Woolfalong – I’ll try to, if I have time – but if not, I’m sure I’ll be exploring more of Woolf’s work eventually anyway. I’ve already read Orlando, which I enjoyed, but any other recommendations would be welcome. When I first read A Room of One’s Own, quite some years ago, it was a revelation to me because it gave me permission to want a room of my own and now I have one! A room where I keep my books, do my writing, and decorate the way I want. And I still think there are millions and millions of women around the world who have talent but neither equality or opportunity. I once read a historical novel about Shakespeare’s sister Judith, though right this minute both the title and author escape me, but it was so great! The novel about Judith sounds interesting! And yes, I’m sure there are still far too many women who are being denied the chance to use their talents through lack of opportunity. It’s such a shame, but hopefully things will continue to slowly improve. I read this quite a while ago and your review is inspiring me to re-read it! Thanks! You’re welcome! I’m sure I’ll be re-reading this myself at some point too. I should really read this again. I read it back in college and although I remember enjoying it, I hadn’t had the adult experiences I have had today (including the sexism and desire to write) and it would likely mean much more to me now. Thanks for the reminder. Great review. I can see how this book would have more meaning once you’ve gained more experience of life. I’m not sure if I would have enjoyed it as much if I’d read it when I was younger. Great review! It’s still such a powerful read, isn’t it? Yes, it is – and I was surprised by how relevant it still felt, even though so many things have changed since Woolf’s day. I didn’t enjoy To The Lighthouse either and it put me off trying more, but this one seems very interesting. I’ll definitely give it a go. So far I’ve read four of Woolf’s books and found them all very different, so I definitely think it’s worth trying another one even if you didn’t like To The Lighthouse. I’ll look forward to your review, Sandra. I think this is a book that benefits from being read slowly and taking notes as you go along. I would like to read it again at some point too, as I’m sure there were a lot of things I missed or didn’t fully understand the first time. “Last night there were four Marys, tonight there’ll be just three. There was Mary Beaton and Mary Seton and Mary Carmichael and me.” Now, if I could just remember the name of the song.